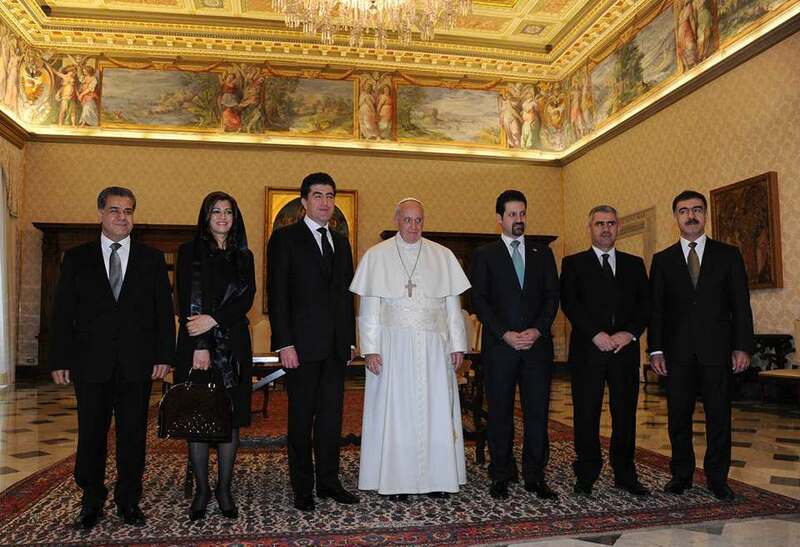 Today, Mrs. Rezan Kader, High Representative of the Kurdistan Regional Government in Italy and the Holy See has accompanied the Prime Minister, H.E. 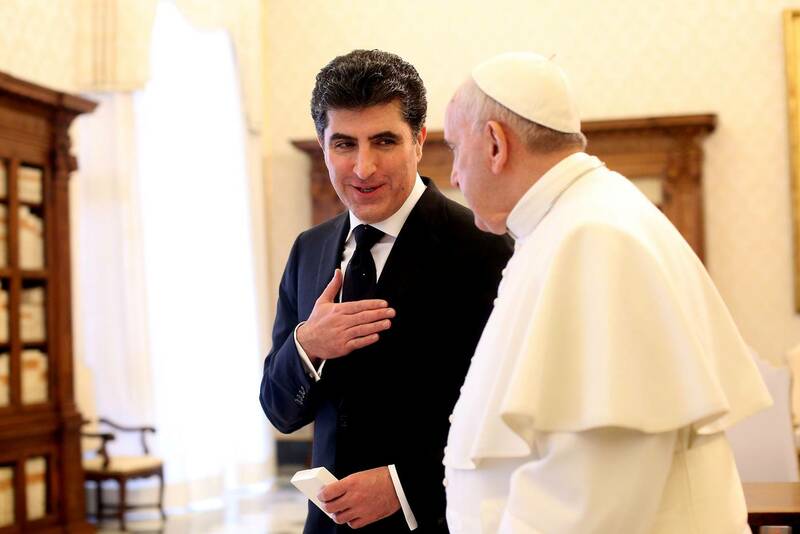 Nechirvan Barzani, and His delegation at the Holy See to meet with His Holiness Pope Francis. In the middle of the interview, the current situation in the region of Kurdistan, in Iraq and throughout the Middle East, focusing on the latest developments of the war against the terrorist organization of the Islamic state, known as ISIS and the importance of the international coalition against terrorism . The two sides reiterated that ISIS is a threat not only for Kurdistan, Iraq and the Middle East, but for all humanity. Prime Minister Barzani briefed His Holiness about the presence of more than 1.4 million displaced Iraqis and Syrian refugees, most of whom have fled the violent repression of ISIS and took refuge in the Kurdistan region. They belong to different ethnic and religious groups from the Nineveh Plain, Sinjar and other parts of Kurdistan and Iraq, where they lived together peacefully for centuries, but tragically have been forced to flee their homes with all their belongings. The Prime Minister reiterated that the people and the Government of the Kurdistan Region have provided, since their arrival, aid and assistance to these refugees and displaced persons. He stressed that the presence of this large number of refugees and internally displaced persons in the Kurdistan region has created a heavy burden for the Kurdistan Regional Government. He has invited His Holiness to encourage donor countries and the international community to increase humanitarian assistance. 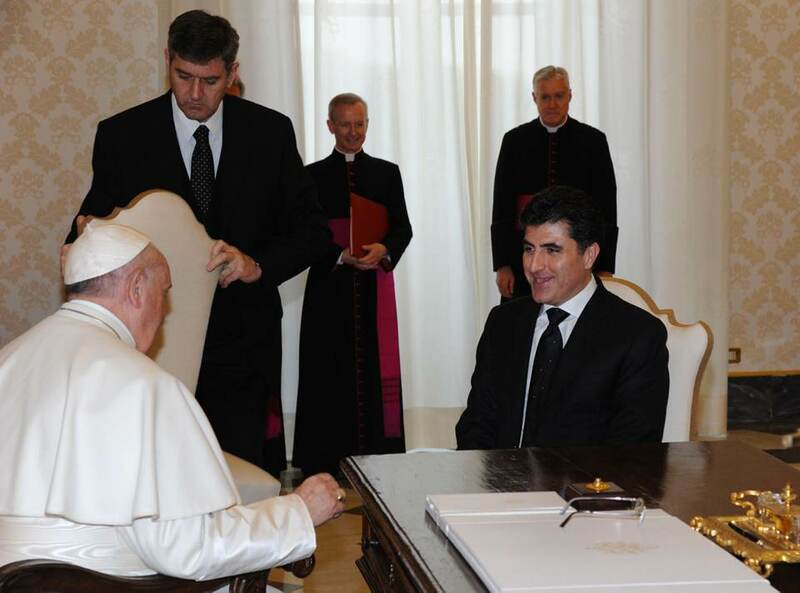 His Holiness Pope Francis expressed his thanks and gratitude to the Kurdistan Regional Government to welcome and provide assistance to Iraqis displaced persons and refugees from Syria. He Praised the coexistence between different ethnic and religious groups living in peace in Kurdistan for centuries. His Holiness also praised the role of the Kurdistan Region in the fight against terrorism to protect the people of the region, which deserves respect and appreciation.